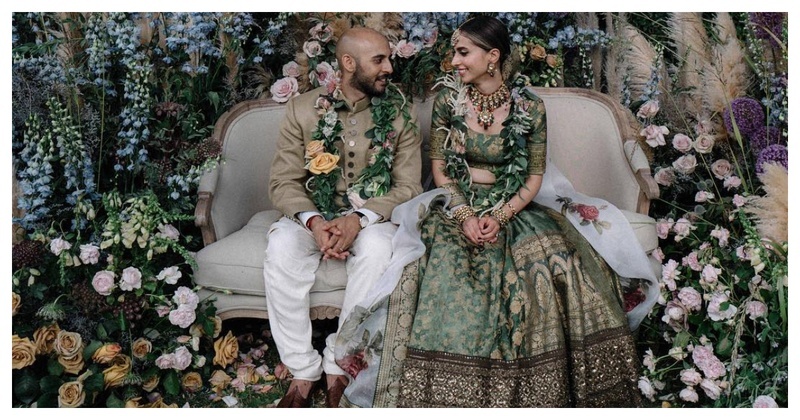 This bride wore a Green Sabyasachi Lehenga & we've never seen anyone look SO Royal! When it comes to bridal couture, there is no acing ace couturier Sabyasachi Mukherjee. Afterall, he's the leading and most sought-after wedding trousseau designer. And now, his craze has clearly transcended the borders - Rome, Italy to be precise. We came across this bride from Hong Kong, who wore the iconic designer's work for her wedding and we swear we've never seen anyone look this royal. Here's proof. Meghna Jhuremalani, an entrepreneur (and a total hottie, btw!) tied the knot in Rome in a stunning forest green Sabyasachi lehenga and I can’t decide what I like more, her lehenga or her! She wore a brocade silk lehenga in a forest green colour, with minimal work and a slightly heavy border and looked stunning. Also, how cool is the signature Sabya style blouse and a white floral dupatta? Totally loving how it’s contrasting the outfit and giving it an edge. Meghna completed the look with minimal day makeup making her look ethereal. Although she balanced that with heavy Sabyasachi jewellery - a chunky kundan choker, with a matching maangtika and earrings. She tied her hair up in a sleek bun which complemented her elegant look. She wore a few kundan bangles in both her hands and oh my God, I just can't get over how beautiful she looked. And, here’s one with her mommy dearest, who’s also wearing a Sabyasachi creation. Well well, here’s wishing this ethereal beauty a lifetime of togetherness!